Andrew Charles "Andy" Grammer (born December 3, 1983) is an American singer, songwriter, and record producer. He is signed to S-Curve Records. His debut album, Andy Grammer, was released in 2011 and spawned the hit singles "Keep Your Head Up" and "Fine by Me". His second album Magazines or Novels was released in 2014, with "Back Home" as the first single. The album's second single, "Honey, I'm Good. ", is his most successful song to date, peaking at number 9 on the Billboard Hot 100. This single has been certified multi-platinum by the Recording Industry Association of America (RIAA) and was ranked one of the ten best-selling songs of 2015 by Nielsen SoundScan. Andrew Charles Grammer was born in Los Angeles, the son of Kathryn Willoughby and recording artist Robert Crane "Red" Grammer, He is of German and English descent. He grew up in Chester, New York, graduating from Monroe-Woodbury High School. As a child, he learned to play the trumpet and later the guitar and piano. He began writing songs at 15. At 20, he left Binghamton University in Vestal, New York, after unsuccessfully auditioning for the Binghamton Crosbys a cappella group and returned to Los Angeles, where he currently resides. In 2007, he graduated from the California State University, Northridge, with a B.A. in music industry studies. Grammer started as a busker on the Third Street Promenade in Santa Monica and later performed in the Viper Room. He was discovered by his manager Aeety in July 2009 and signed with label S-Curve Records in April 2010. Grammer's popular songs include: "Honey, I'm Good", "Keep Your Head Up", "Fine By Me", "Lunatic", "Ladies", "Biggest Man in L.A.", "Numbers", "Stepping Stone", "Couple More Sleeves", "Fireflies", and "The Pocket". His debut video "Keep Your Head Up", which featured actor Rainn Wilson, was an iTunes Video of the Week in 2010, and the version of the video on Grammer's website uses an interactive interface that allows the viewer to "send the singer into goofy scenarios". He performed the song on The Rachael Ray Show on November 17, 2010. It has since debuted at No. 94 on the Billboard Hot 100 Grammer's debut album sales for the first week earned him the No. 1 spot on the Billboard New Artist Chart. He opened for Plain White T's for the second leg of their "Wonders of the Younger" tour in the spring of 2011. In January 2011, he was named an "Artist to Watch" by Billboard magazine. He performed at SXSW 2011, playing BMI's Acoustic Brunch, where he was one of the artists contributing to a recording produced by Hanson to benefit the victims of the 2011 Japan earthquake. He won MTV's "O Music Awards" for most innovative video for his "Keep Your Head Up" video on April 25, 2011. His debut album, Andy Grammer, was released on June 14, 2011 on S-Curve Records. The self-titled album was produced by Matt Wallace from Maroon 5, Matt Radosevich, Dave Katz, and Sam Hollander of Gym Class Heroes. He joined Natasha Bedingfield on her Less is More Tour, starting June 2011, and Colbie Caillat on her U.S. and Canada tour, starting August 2011. Grammer opened shows with Kate Voegele and Kevin Hammond. The Grammy Museum, in Los Angeles, featured him for the museum's first installment of its homegrown local artist series starting May 2011. On November 16, 2011, Grammer announced his 2012 headlining tour. On May 21, 2013, Grammer released a new EP, Crazy Beautiful, which was features two original songs, "Crazy Beautiful" and "I Choose You", and a live version of "Crazy Beautiful". The new EP was released by S-Curve Records. On March 25, 2014, he debuted "Back Home", the lead single from his second album, Magazines or Novels. The song, co-written with Ryan Met from the group AJR, was released to iTunes on April 8, 2014. The album was released August 5, 2014. He went on the "Siren Songs" tour with Los Angeles-based recording artist Hughie Stone Fish in September 2014. In November 2014, he released his biggest single to date, "Honey, I'm Good." which peaked at #9 on the Billboard Hot 100, and was certified triple-platinum by the RIAA. On August 31, 2015, he was announced as one of the celebrities who will compete on the 21st season of Dancing with the Stars. He was paired with professional dancer Peta Murgatroyd until an ankle injury forced her to withdraw. His new partner was Allison Holker. Grammer and Holker were eliminated on Week 8 of competition and finished in 7th place. In addition to his stint on the show, he released a new single "Good to Be Alive (Hallelujah)" on August 24, which was another gold-certified hit for him, and was included on a re-issued deluxe version of his Magazines or Novels album. On October 27, 2015, he performed the National Anthem prior to the start of the opening game of the World Series between the Kansas City Royals and the New York Mets at Kauffman Stadium in Kansas City. In January 2016, he performed an a cappella version of "The Star-Spangled Banner" at the Denver Broncos–New England Patriots AFC Championship Game in Denver. Of his influences, he said: "I have three different places that I draw inspiration from. There's the guitar guys like Jason Mraz, John Mayer and Jack Johnson; piano influences like Coldplay, The Fray and OneRepublic. I also really love how hip-hop creates complexity in words. I love Common, Lauryn Hill, Jay-Z and Kanye West." Grammer is a member of the Bahá'í Faith. In July 2012, Grammer married singer/songwriter Aijia (née Guttman). In March 2016, his wife auditioned on The Voice and Grammer was interviewed during her pre-performance package. However, she did not advance. "Good to Be Alive (Hallelujah)"
↑ In France, "Keep Your Head Up" charted as the French version featuring Mélissa Nkonda, alternatively titled "Relève la tête". ↑ "Miss Me" did not enter the Ultratop 50, but peaked at number 35 on the Ultratip chart. ↑ "Fresh Eyes" did not enter the Ultratop 50, but peaked at number 24 on the Ultratip chart. 1 2 3 Tacopino, Joe (March 8, 2011). "Andy Grammer Goes From Busker to Pop Phenom, With Rainn Wilson's Help". Spinner. Retrieved May 9, 2012. 1 2 Rome, Emily (June 13, 2011). "How Andy Grammer Graduated from Street Busker to the Majors". HollywoodReporter.com. The Hollywood Reporter. Retrieved May 2, 2013. ↑ "Andy Grammer Launches Campaign for Women's Equality". Broadwayworld.com. May 10, 2013. Retrieved December 12, 2013. ↑ Smith, Haley (December 2, 2010). "Performer Andy Grammer Brings Hollywood to TJC". MyTJCNews.com. MyTJCNews.com. Retrieved May 2, 2013. ↑ "Rolling along, singing a song. By Robert Crane Grammer (Red Grammer) & Kathryn Willoughby Grammer". Copyrightencyclopedia.com. Retrieved 2016-06-02. 1 2 "Andy Grammer: 20 Things You Didn't Know...". 96.5 TIC FM. March 27, 2013. Retrieved December 12, 2013. ↑ Herman, Emily (February 21, 2012). "Andy Grammer Visits Children's Hospital Of Philadelphia!". Ryanseacrestfoundation.org. Retrieved December 12, 2013. 1 2 Morelli, Christina (November 19, 2009). "Andy Grammer: Sincere, Soulful, and All Smiles". NYCArtScene.com. NYC Art Scene. Retrieved May 2, 2013. ↑ Demchak, Erin (February 24, 2011). "Andy Grammer Chats With Starpulse Before His Show At The Troubadour". Starpulse.com. Starpulse.com. Retrieved May 2, 2013. ↑ "Andy Grammer Keeps His Head Up". Grammy.com. June 30, 2011. Retrieved December 12, 2013. ↑ Galperina, Marina (January 25, 2011). "Andy Grammer -- About to Pop". popeater.com. AOL Music. Retrieved May 2, 2013. 1 2 Lopez, Korina (June 13, 2011). "On the Verge: Andy Grammer". USA Today. Retrieved December 12, 2013. ↑ Bruno, Antony (October 25, 2010). "Andy Grammer, Rainn Wilson Create Viewer-Interactive Video". Billboard.com. Billboard. Retrieved May 2, 2013. ↑ Jurgensen, John (November 5, 2010). "Who Let the Videos Out". online.wsj.com. The Wall Street Journal. Retrieved May 2, 2013. ↑ "Andy Grammer Performance". RachaelRayShow.com. KWP Studios Inc. November 17, 2010. Retrieved May 2, 2013. ↑ Trust, Gary (June 8, 2011). "Adele's Still 'Deep' Atop Hot 100, Coldplay Makes a Splash". Billboard.com. Billboard. Retrieved May 3, 2013. ↑ Grammer, Andy (April 23, 2012). "News |". Andy Grammer. Retrieved May 9, 2012. ↑ Fuoco-Karasinski, Christina (March 22, 2011). "Plain White T's add more "Wonders of the Younger" dates". SoundSpike.com. SoundSpike Media. Retrieved May 3, 2013. 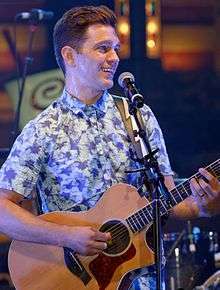 ↑ "Andy Grammer concert at Bay". DailyPress.net. Daily Press (Michigan). February 21, 2011. Retrieved May 3, 2013. ↑ Kennedy, Drew (March 11, 2011). "SXSW Ready: Andy Grammer". BMI.com. Broadcast Music Inc. Retrieved May 3, 2013. ↑ Chancellor, Jennifer (March 23, 2011). "Hanson to release digital album for Japan quake victims". TulsaWorld.com. Tulsa World. Retrieved May 3, 2013. ↑ Kaufman, Gil (April 25, 2011). "Andy Grammer Wins O Music Awards' Most Innovative Video – Music, Celebrity, Artist News". MTV. Retrieved May 9, 2012. ↑ "Arcade Fire | Grammer Wins First MTV O Music Award". Contactmusic. April 26, 2011. Retrieved May 9, 2012. ↑ "iTunes Store". itunes.apple.com. Retrieved May 9, 2012. ↑ "NATASHA BEDINGFIELD ANNOUNCES "LESS IS MORE" SUMMER TOUR PRESENTED BY FRESCHETTA®" (Press release). Sony Music Entertainment. April 19, 2011. Archived from the original on May 7, 2011. Retrieved May 7, 2011. ↑ "Andy Grammer on tour with Colbie Caillat". andygrammer.com. August 8, 2011. Retrieved July 5, 2012. ↑ Lewis, Andy (May 17, 2011). "Grammy Museum to launch Homegrown series spotlighting L.A.-area music on May 31 with Andy Grammer* (Updated)". Latimesblogs.latimes.com. Retrieved May 9, 2012. ↑ "2012 HEADLINING TOUR ANNOUNCEMENT". Andy Grammer's official website. November 16, 2011. Retrieved July 5, 2012. ↑ "Andy Grammer Unveils New Feel-Good Single 'Back Home': Listen". Ryanseacrest.com. 2014-03-25. Retrieved 2015-05-22. ↑ "On Air/Ryan Seacrest Twitter". Twitter. August 31, 2015. Retrieved August 31, 2015. ↑ Gomez, Patrick (August 31, 2015). "Dancing with the Stars' Peta Murgatroyd Sidelined for Season 21 Due to Injury". People. Retrieved August 31, 2015. ↑ "'Dancing with the Stars' Recap: Immunity and the Dance-Offs". buddytv.com. Retrieved November 2, 2015. ↑ "Questions + Answers with Andy Grammer" (PDF). Brilliantstarmagazine.org. Retrieved December 12, 2013. ↑ Samelson, Chelsea (2015-04-09). "Ode to the faithful: Andy Grammer's new anti-cheating anthem". New York Post. Retrieved 2015-09-01. ↑ Piper, Serena (July 28, 2012). "CL Exclusive! "Keep Your Head Up" Singer Andy Grammer Talks College". CollegeLifestyles.org. College Lifestyles. Retrieved May 29, 2013. ↑ "Andy Grammer Album & Song Chart History – Billboard 200". Billboard. Archived from the original on July 19, 2011. Retrieved July 19, 2011. ↑ "Andy Grammer Album & Song Chart History – Heatseekers Albums". Billboard. Archived from the original on July 19, 2011. Retrieved July 19, 2011. ↑ "The World Is Yours: Andy Grammer: MP3 Downloads". Amazon.com. Retrieved 2016-06-02. ↑ "Corsair 22 April 2009 — California Digital Newspaper Collection". Cdnc.ucr.edu. 2009-04-22. Retrieved 2016-06-02. 1 2 "Billboard Charts". Billboard. Retrieved April 16, 2015. All except noted: "Discography Andy Grammer". Australian-charts.com. For "Keep Your Head Up": Ryan, Gavin (June 21, 2014). "ARIA Singles: Justice Crew Top ARIA Singles For 7th Week". Noise11. Retrieved June 21, 2014. For "Honey, I'm Good. ": Ryan, Gavin (May 30, 2015). "ARIA Singles: Taylor Swift Bad Blood Is No 1". Noise11. Retrieved May 30, 2015. ↑ "Belgian Charts (Flanders)- Ultratop 200 Albums & Ultratop 50 Singles/Ultratip 100". Ultratop 50. ultratop.be/nl. Retrieved September 28, 2012. ↑ "Andy Grammer – French Singles Chart". Hung Medien (in French). Retrieved August 30, 2015. ↑ "Netherlands Charts: Dutch Album Top 100 & Single Top 100". MegaCharts (in Dutch). dutchcharts.nl. Retrieved September 28, 2012. ↑ "Andy Grammer – New Zealand Singles Chart". Hung Medien. Retrieved February 2, 2012. ↑ "Andy Grammer – Swedish Singles Chart". Hung Medien. Retrieved August 30, 2015. ↑ "Andy Grammer". Official Charts Company. Retrieved 30 August 2015. 1 2 "ARIA Charts – Accreditations – 2016 Singles". Australian Recording Industry Association. Retrieved August 30, 2016. ↑ "ARIA Australian Top 50 Singles". Australian Recording Industry Association. November 14, 2016. Retrieved November 12, 2016. ↑ "NZ Top 40 Singles Chart". Recorded Music NZ. December 5, 2016. Retrieved December 2, 2016. ↑ "Sverigetopplistan - Sveriges Officiella Topplista". Sverigetopplistan. Retrieved November 12, 2016. 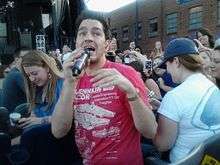 Wikimedia Commons has media related to Andy Grammer.